Oh, low-quality, poorly lit mirror shots, how I’ve missed thee. I have been looking for a really great statement necklace for aaaages now, but the usual high street subjects couldn’t come up with the goods and the likes of Mawi and Lamprini were a bit over budget, so I turned to Etsy. 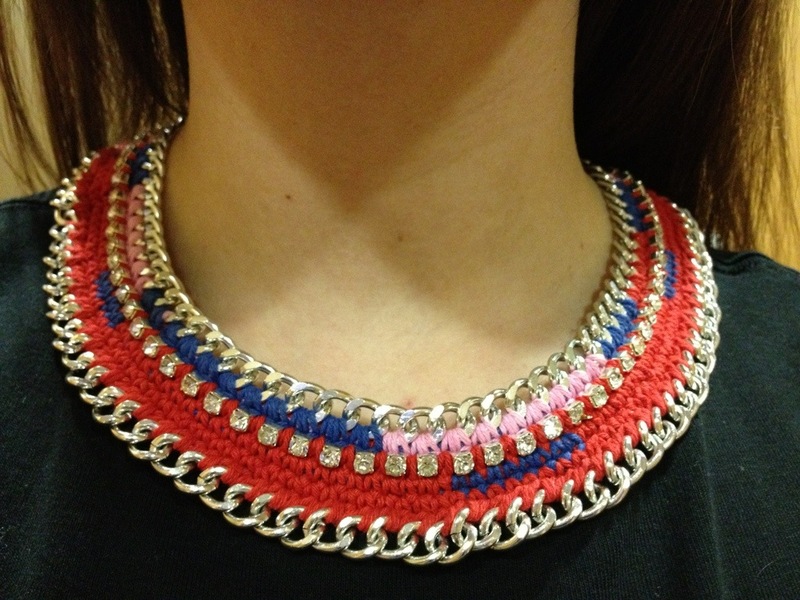 This Mimic Design collar leapt out at me, so I ordered it for around £20, and I am just so thrilled with it! It is exactly what I was looking for! I’m off out tonight, so I’m planning to swap the skirt for boyfriend jeans and show off my new neckwear. You can look forward to the hangover shot tomorrow! I was inspired to buy this ripple print dress from Room 31 after seeing Avril of School Gate Style and Fiona of Avenue 57 looking so great in their similar versions. After a 25% discount using SGS25, the dress was down to £10.50, so I thought I’d give it a whirl. It arrived yesterday and I was a little apprehensive about such a bold bodycon number, but actually I think it’s very flattering indeed! I’m wearing it with opaques and my neon & Other Stories flats, but I’m also planning on styling it with bare legs and sporty trainers for a more casual summer look. I love midi-dresses as they keep my bête noire, my chubby knees, firmly under wraps, and are great for showcasing a curvy silhouette without looking too obvious. 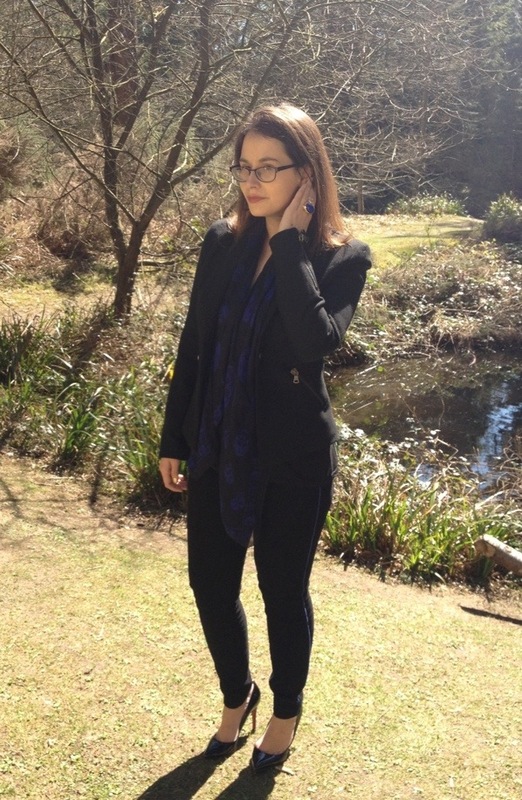 And even better, they’re totally on trend at the moment – for once, fashion is my friend! 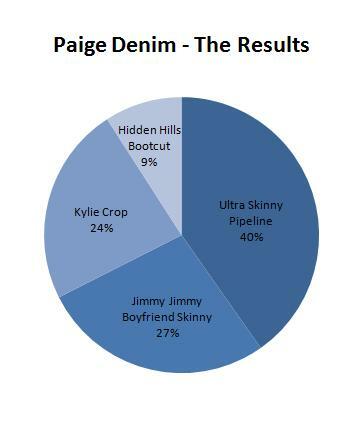 Paige Denim – The results are in! As you can see, the Ultra Skinny Pipeline was the winner by some way, so those are the ones I’m keeping right? Well, er, no actually. Because I’m a contrary Mary, I’ve plumped for the second finisher, the Jimmy Jimmy Boyfriend Skinny. 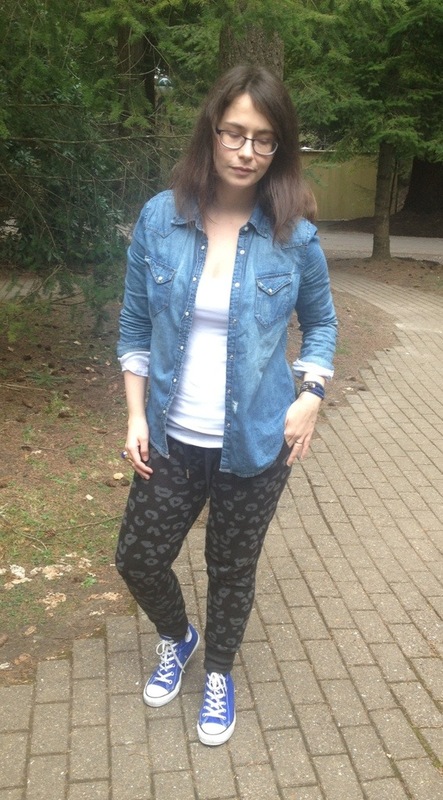 Don’t get me wrong, I loved the Pipelines, but they definitely had more of a ‘going out’ vibe to them, and as a mother of two toddlers with an expensive and underused pair of black leather leggings hanging in my wardrobe, purchased to cover all going-out-needing-slinky-black-bottoms eventualities, I felt I needed a more ‘everyday’ jean. My husband was actually massively in favour of me keeping the Kylie crops, though I strongly suspect this was because they were the tightest, as opposed to any fashion-related motivation. I nearly went for these too, as I loved the look of them with my pointy flats, and it pains me to send them back, so I might well get them for the summer. 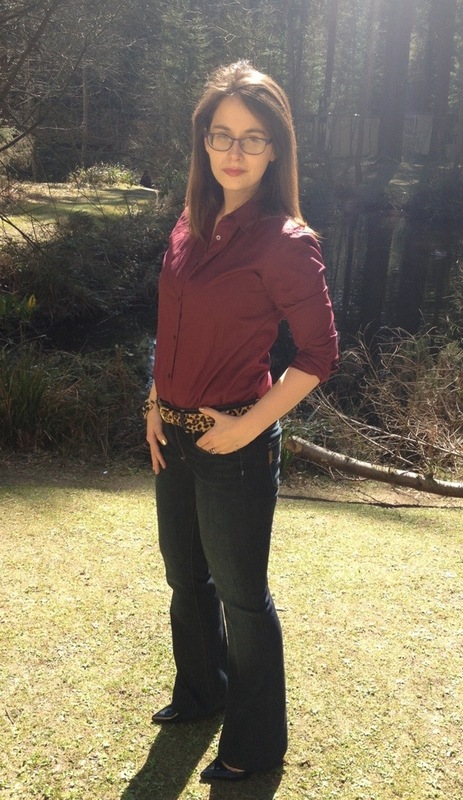 The Hidden Hills Bootcut received the least love in the poll – I don’t think my short legs did them justice! Again, I really liked these, and found them extremely comfortable to wear. The only limiting factor for me would be the need for heels, putting them firmly in the ‘going out’ jeans camp also. This would not be a problem if you have long legs. I imagine not much is a problem if you have long legs <cries>. They are soooo comfy, genuinely up there with loungewear (read: pyjamas) in terms of comfort. I love the subtle distressing on them. I know this season we’re supposed to have half our thigh on show, but mine really aren’t up to the scrutiny. They work with boots, flats, sandals, high tops – you name it, they look great with any footwear. At the end of the day, I am a fashion blogger, and boyfriends are the cut of the season! Bit of a random outfit, this one. I was wearing the jersey cardigan but got so hot from cycling and swimming I took it off but inexplicably left the scarf! When I was approached to review some shoes from the Mary & Clarks collection, I knew exactly the pair I would chose – the La Promenade Studded Brogue. I had tweeted about them earlier in the week, and they were already on my mental shopping list, so it was great to have the opportunity to ‘try before you buy’. And buy I most certainly shall, as these shoes are, in the words of someone much cooler than me, the bomb. The Mary in question is of course, Mary Portas, of Queen of Shops fame, and as you would expect from such a shrewd businesswoman, these shoes are considered and carefully thought out. 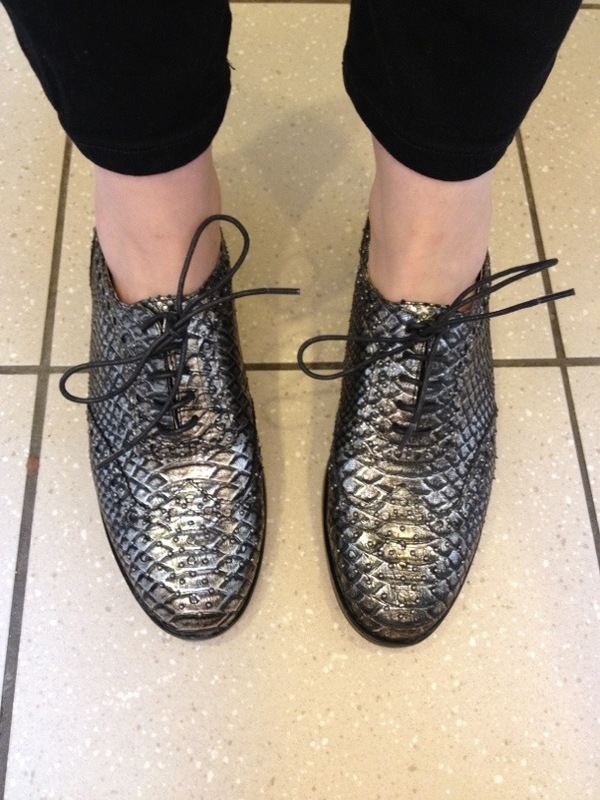 The combination of brogue style, metallic snake print and studs is fabulously OTT and completely on trend (rather like Mary herself). I love the juxtaposition of sensible shoe with blingy glamour – I would feel completely comfortable (in both senses of the word) wearing these shoes on a night out. If you want a slightly more toned down version, they also come in black or white. The leather is light and soft, the laces are waxed, so won’t get soggy in the rain, and the best part? They have underfoot padding. I know – heaven! One thing I will say though is, if you are between sizes, size down. I usually wear a 6, or a 5.5 if I can find one, but the sample I was sent to review is a 5, and it fits like a glove. Now, I know what you’re all thinking, a blogger paid to plug a product will wax lyrical about any old bobbins. Well, no. Firstly, I have far too much integrity for that kind of carry-on and secondly, the shoes are only on loan (sob) and I was not paid a penny for this review. I genuinely just think these shoes are brilliant, and I like to share my discovery of anything great with you lot. 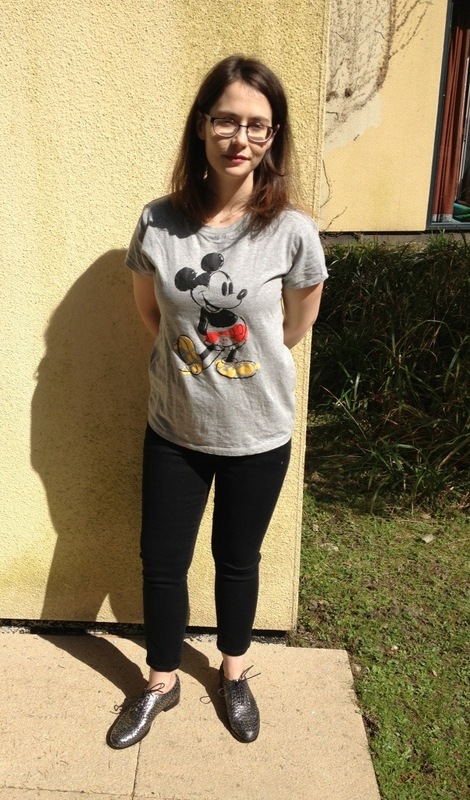 I have styled them here with cropped jeans and a (slightly crumpled) Mickey Mouse t-shirt for a casual look, but for work I will wear them with slim-fit tailored trousers and a fitted shirt, or even a midi-skirt. Luckily for me, there is currently 20% off the entire Mary & Clarks collection when you enter code “BMARY13” at the checkout. Even if the brogues aren’t for you, check out the rest of the range, because it’s not often you find shoes of this quality at a sensible price! I’ve also got my eye on the La Lumiere in blue snake and the La Tullerie in grey snake. If you’ve been reading this blog a while, you’ll have worked out that I’m a huge fan of premium denim. So when The Dressing Room asked me if I’d like to style and review some Paige jeans as part of their Denim Dedication month, I jumped at the chance! First up are the Kylie crops in Harper. Every girl needs a pair of crops in her wardrobe, and this pair would be an excellent one to have. They are a flattering mid-rise, with a lovely slim fit through the leg; I know cropped flares are back this season, but I can’t be doing with any flapping round my ankle! I really like the slightly vintaged wash on these – perfect for laid-back cool. They’re not incredibly cropped on my short legs, but I still think they work. 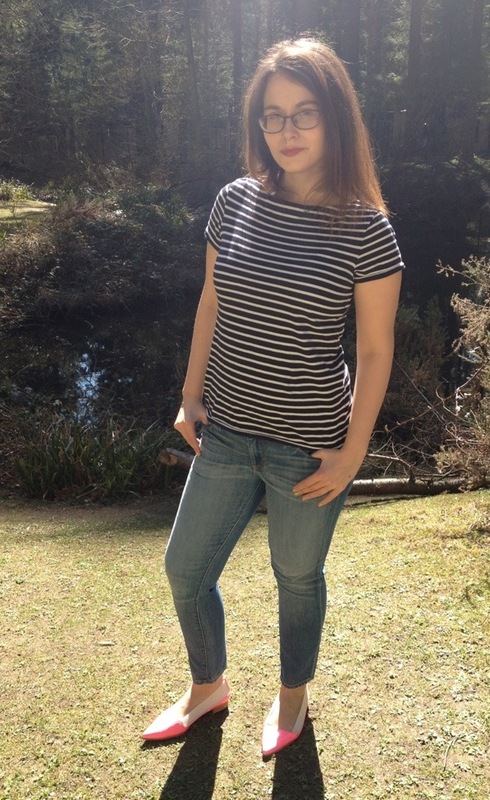 I’ve decided to channel my inner Audrey in a boat neck Breton tee and pointy flats. The next pair I tried were the Hidden Hills boot cut in Super McKinley. 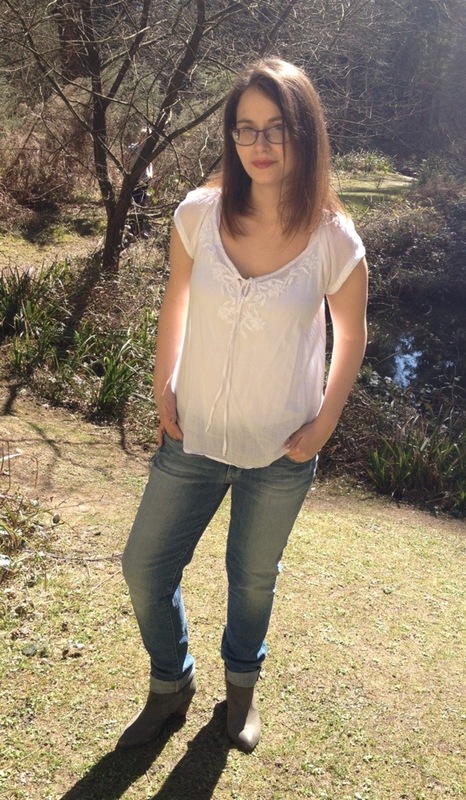 These jeans totally put paid to the theory that boot cuts are frumpy! 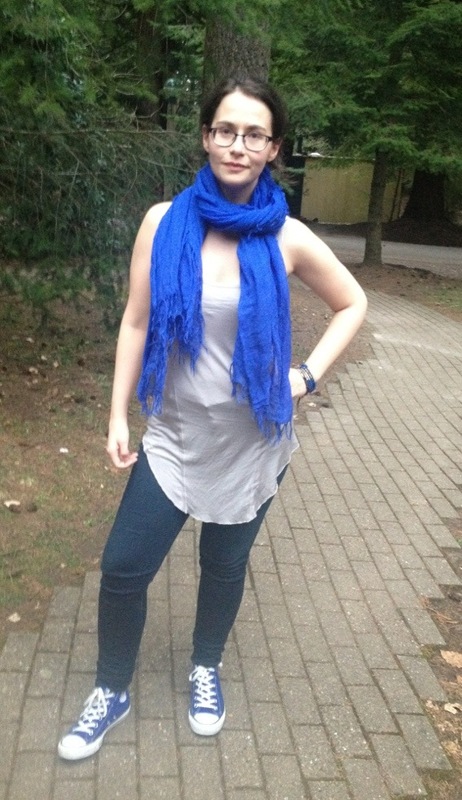 Super leg-lengthening with a 9″ rise (I do love a high-rise), these jeans are incredibly flattering. The more eagle-eyed among you may notice that I have had to turn these jeans under at the hem, as the inside leg measurement on them is 34″, and on me it’s more like 29″, sadly! This makes these jeans a great alternative for all you leggy lovelies out there, and as for us less blessed in that department? Well, it’s nothing that a minor alteration can’t sort out. As they are so smart, I’ve styled them for a dress-down Friday look I could wear to work, pairing them with a burgundy fitted shirt, leopard belt and patent heels. The Jimmy Jimmy Boyfriend Skinny is the cut of the season, and I can see why! 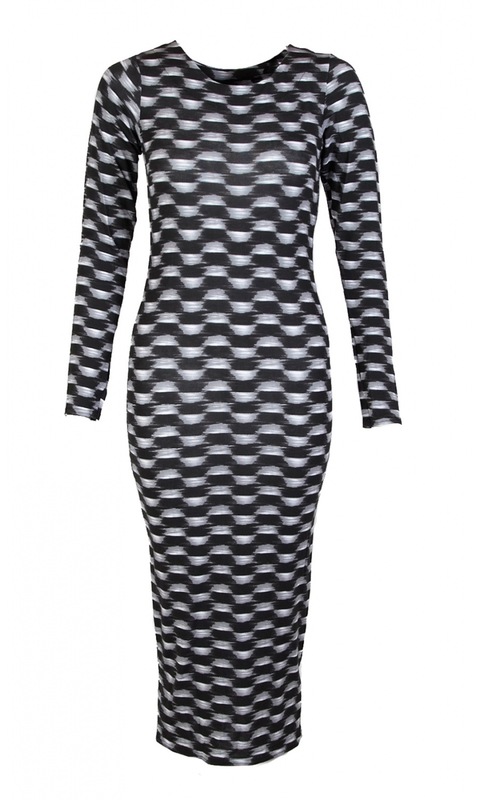 The relaxed fit is unbelievably comfortable and surprisingly slimming, plus the style is so versatile. These really are jeans you can wear for any occasion – they work as well with heels as high-tops! Another sensible mid-rise of 8 3/8″ (none of this 6″ nonsense here) also makes them totally appropriate for toddler-wrangling. I’m playing cowgirl today, pairing them with a white prairie-style blouse and suede ankle boots. The last pair I tried were the Ultra Skinny pipeline jeans in Black. Now these jeans could have been designed with me in mind – super skinny black, with cobalt piping down the outer seams and around the pockets. They are more a twill than a denim and feel so velvety and strokeable! Given their super-slinky nature, I’ve styled them for a night out with a black vest, a fitted black blazer and ultra-pointy courts, picking up the cobalt detailing in my accessories. So, which jeans do you think suit me best? You can vote using the poll below! If you are in the market for new jeans, I wouldn’t hesitate to recommend Paige, the fit and quality really are excellent. The Dressing Room carry a diverse range of styles from denim giants such as J Brand, Current/Elliott, Hudson and of course Paige, and the girls are really knowledgable, friendly and determined to help you find your perfect pair, so even if you’re ordering on line, give them a call and they’ll be glad to help you out. And if that’s not enough, they are currently offering the chance to win a pair of Paige jeans on their excellent blog, just by choosing your favourite look – so what are you waiting for? Day two of my holiday wardrobe experiment and I’m missing the intended accent colour item (the Chan Luu scarf) as the weather is so glorious! Therefore the look is pretty simple, but I think the white boots lift it a bit.